The 2382-15 17th Edition course South London covers all aspects of the previous 17th Edition course but also includes the new sections specified in amendment 3. The 17th Edition South London course has no practical elements and includes classroom work only. The examination for the 2382-15 course in South London is two hours long and takes place on the third day of the course. Once a candidate has successfully passed the 17th Edition course, they will be qualified to carry out work to 17th Edition standard. The 17th Edition Course (including amendment 3) is 3 days long. All candidates are required to read and bring to the course, a current copy of 17th Edition Wiring Regulations. If you want a 17th Edition Wiring Regulations qualification in South London, then the industry standard is the City & Guilds 2382-15 17th Edition training course. 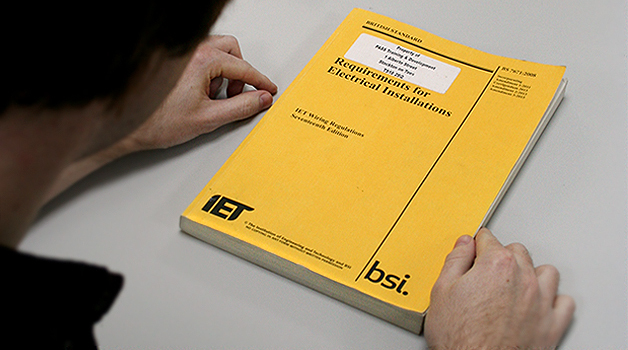 This 17th Edition course is the most up to date version of the IEE British Wiring Regulations. All those who work within the electrical industry will find this course very useful. On successful completion you will hold an industry wide recognized qualification, as well as a comprehensive knowledge of the Regulations. If you have completed previous wiring regulations courses then you will still need to do this course in order to get you working to the current standard. This is a must have course for anyone working in the electrical domain. It is perfectly located for those in the Surrey and South London areas.